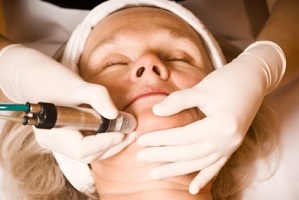 Electrolysis is considered as a modern permanent hair removal techniques which can be used for unwanted hair. During electrolysis the hair follicle is destroyed by electric shock – it is done by sliding a needle into the skin, along the side of a hair; after that a short zap of electricity is shot through the hair to kill it; and then the hair is pulled out with tweezers. Electrolysis could be recommended for unwanted facial hair but this method is not suitable for legs and/or bikini. But some modern electrolysis equipments can be easily used at home for different parts of body. A small area such as the upper lip could take a total of 4 to 10 hours and a larger area could take 8 to 16 hours. Not always the electrolysis can insure permanent hair removal – some hairs do grow back and some are missed and should be done again. It is pretty slow and tedious procedure – only one hair can be done at a time. Many women mention permanent hair removal after using this method. Electrolysis takes big bucks and lots of time, so it’s usually only used on smaller areas such as the upper lip, eyebrows, and underarms. Many people describe the process as painful and dry skin, scabs, scarring, and inflammation may result after treatment. Infection may be a risk if the needles and other instruments aren’t properly sterilized. Modern equipments could be expensive but very effective. Home electrolysis is not recommended, as it is too easy to scar your skin if it is done incorrectly – this procedure requires considerable skills. Deluxe Home Electrolysis clean+easy® Deluxe Home Electrolysis is an economical system that provides professional results at home. – Battery operated – convenient and portable. – 3-sided folding pouch; 1-year guarantee.